As many of my readers may be aware, I participate in quite a few food blogging challenges where, each month, we are challenged to cook with a specified ingredient. I always look forward to the start of a new month and the new wave of challenges – what do we get to work with this month?! That’s as close to ‘meal planning’ as I get! 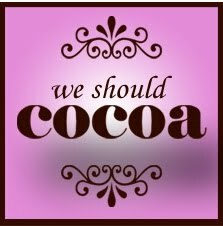 I was delighted when Jen of Blue Kitchen Bakes, who hosts the We Should Cocoa challenge alternately with Chele from Chocolate Teapot and Choclette at Chocolate Log Blog, announced the theme for this month’s challenge: ginger! The first thing that popped into my mind when I read the challenge ingredient was crystallized ginger. I remember the first time I was introduced to this old fashioned treat – a dear, eccentric childhood friend had made some from scratch and I was very curious as to what it was. I have to say I didn’t particularly care for it, back then, but I wasn’t as keen on trying new things when I was a child. I haven’t tried it since, hence my desire to make it myself and see what it’s really like with my more refined taste buds. I love it! Fortunately my children do not have the same aversion I had to trying new things (unless it involves potatoes) and they love it too! Ginger made its way into Europe in the ninth century and it was a popular spice during the Roman Empire. Marco Polo wrote about it, it is mentioned in the Jewish Talmud and Henry the VIII praised its use to ward off the plague. After the Roman Empire fell use of ginger in Europe declined until Marco Polo returned from an Asian trip and reintroduced the spice, which was often preserved in sugar and crystallized ginger became popular in England. (You can find out all sorts of interesting things about ginger here). There we go. It’s a sweet and it’s good for you! Win! This recipe is adapted from David Lebovitz: Living the Sweet Life in Paris. 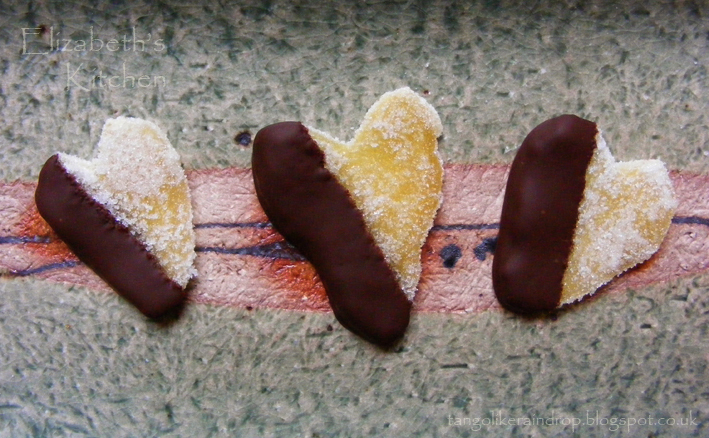 I scaled down the quantities and dipped some of the crystallized ginger in melted dark chocolate as a little Valentine’s sweet for my sweethearts. An old-fashioned warming sweet for your sweetheart! 1. Peel the ginger root. Use a spoon for this, as it makes it a lot easier. Be careful for ginger root juice spray! 2. Slice ginger root into slices as thin as you can possibly get. Aim for 2 mm or so thickness. 3. Place ginger in a large stainless steel pan and cover with water. 4. Bring to the boil; reduce heat and simmer for 10 minutes. 5. Drain water from the ginger. Fill pot with fresh water and simmer again for a further 10 minutes. Drain. 6. Stir together 240 grams of sugar, 300 ml water and pinch of salt; add to the sliced ginger root in the pot. 7. Bring to the boil and boil until it reaches a temperature of 106 C (use a candy thermometer). 8. Remove from heat and leave in the pot to cool for an hour. 9. Drain syrup well (store syrup in a jar for use in other cooking). 10. Dredge the ginger slices in caster sugar and arrange on a baking tray lined with grease proof paper. Leave to dry over night. The leftover sugar can also be used in baking, so don’t throw it out! 11. Melt chocolate in a heat proof bowl suspended over a pan of barely simmering water.12. 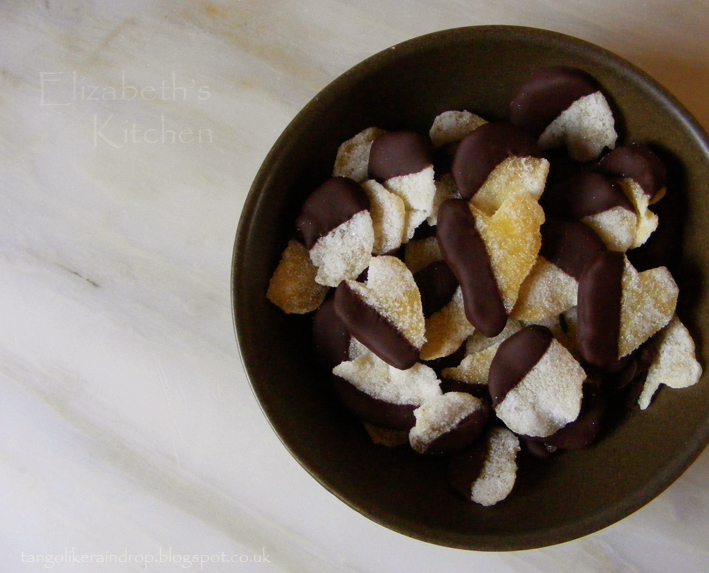 Dip the crystallized ginger into the chocolate and leave on some grease proof paper to harden. I would like to make these as a gift. How long would they keep in a jar for? 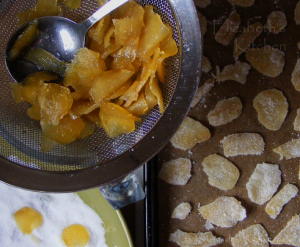 Ooh, ooh, ooh, I want to have a go at making my own crystallised ginger now, you really are a star. And I love the fact you’d get masses of ginger tea to keep you going while you made it. They look so pretty, thank you for entering them into We Should Cocoa. I’m a recent convert to crystallised ginger but I love the idea of making my own from fresh ginger. It really is remarkably easy to make. The most fiddly bit is trying to get the slices as thin as possible. I can, from first hand experience, say that this was delicious! I love crystallized ginger and will be trying this!